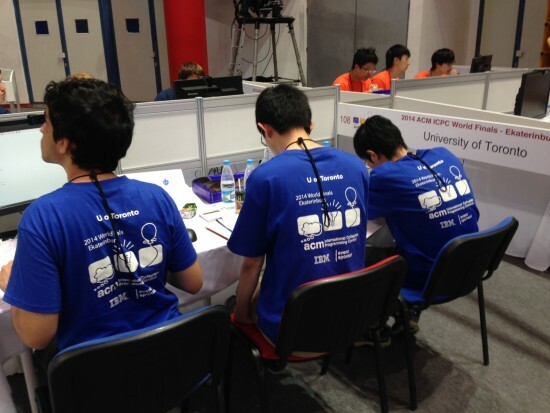 Three university students from St. Petersburg State University walked away from a global coding competition as world champions in their home country at the International Collegiate Programming Contest (ICPC) sponsored by IBM Corp. Hosted in Ekaterinberg, Russia by Ural Federal University, where the dividing line between Europe and Asia can be found, 122 university teams from around the world crunched high-level mathematical problems for a gruelling five-hour computer programming contest. Also winning gold medals by finishing in the top four schools at the contest were Moscow State University, Peking University, and National Taiwan University. University of Toronto team at the Ekaterinburg, Russia competition. Two Canadian teams were in eastern Russia for the competition. The University of Toronto finished in 59th place overall by solving two problems, filing the second solution at the 377 minute mark. The University of Lethbridge came in 90th place overall, solving one problem and filing their answer at the 164 minute mark. Competition rankings are determined by filing the most answers, and tie-breakers are determined on who was quicker to solve the problems. 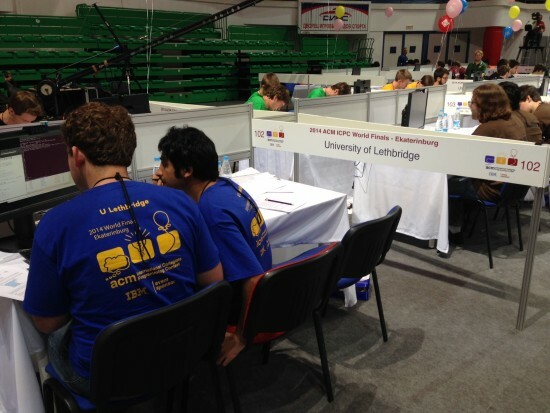 The University of Lethbridge team competes at ICPC.